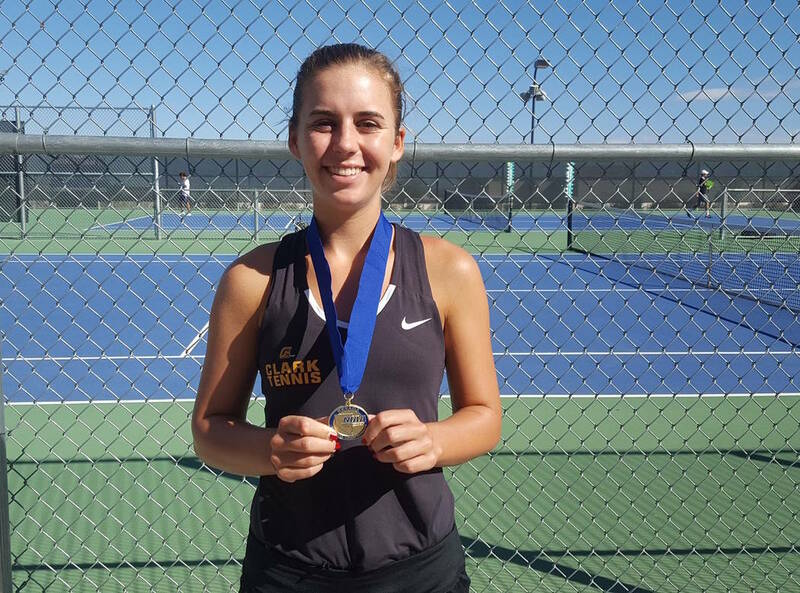 Boch-Collins used a cerebral effort rather than a hard approach to defeat Bishop Gorman senior Angelique Friedrich on Friedrich’s home court, 6-2, 6-1 in the girls singles final. Clark junior Audrey Boch-Collins said that’s her process every time she steps on the court. That, and making life miserable for her opponent. 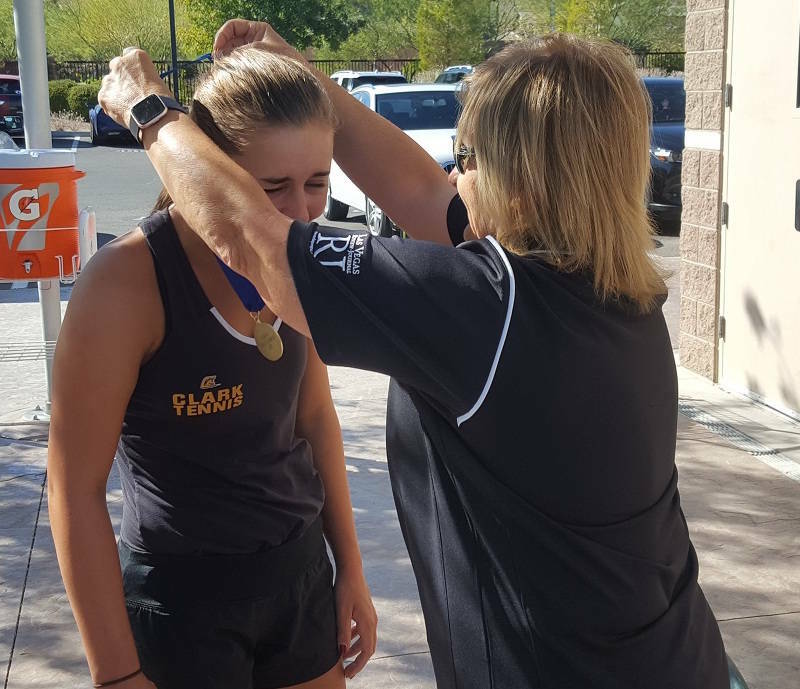 The strategy was in full effect Friday in the Desert Region girls singles final, as Boch-Collins used a cerebral effort rather than a hard approach to defeat Bishop Gorman senior Angelique Friedrich on Friedrich’s home court, 6-2, 6-1. Boch-Collins, who can use her overpowering forehand at any time, mixed her shots against Friedrich, either with high floating shots to the baseline, or piercing shots just over the net. Her disruptive flow baited Friedrich into self-inflicted mistakes throughout the match. Friedrich, who delivered several blistering shots that might have been winners against anyone else, said the combination of her own unforced errors and her opponent’s strategy kept her at a disadvantage. After breaking Boch-Collins’ serve to start the second set, Friedrich never could capitalize to set her own tone, as Boch-Collins went on to win the final six games of the match. Coronado’s Madison Smith took third place with a 6-0, 6-0 win over Basic’s Tjaden Giles. In the boys singles final Green Valley’s Andre Millett needed three sets to defeat Clark’s Rahul Gupte, 6-4, 3-6, 7-5, to win the title. Coronado’s Aiden Benoualid beat Clark’s Max Foels 7-5, 6-4 to take third place. 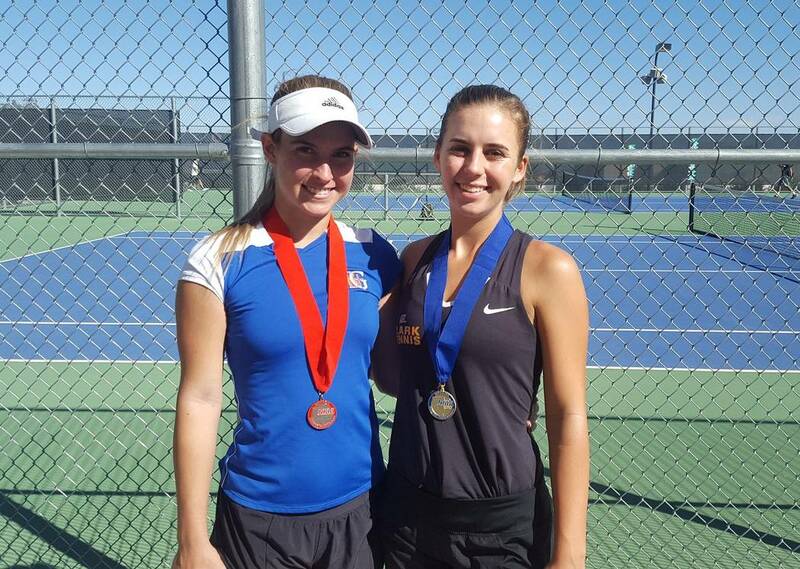 Coronado’s Blythe Buntrock and Kennedy Buntrock defeated teammates Paige Furin and Megan King 6-4, 6-2 to win the girls doubles championship. Sierra Vista’s Ariana Stanciu and Andrada Stanciu beat Clark’s Joanna Yi and Kelly Mader 6-1, 6-1 to take third place. Gorman’s Max Wolfson and Oliver Filipovic won the boys’ doubles title with a 6-4, 6-1 win over Coronado’s Ethan Quandt and Sebastian Frace. Mark Bernales and Simran Shah from Clark took third place with a 6-2, 6-2 win over Desert Oasis’ Tyler Parlade and Tyler Nicholas. The top three places in each flight advance to the state tournament, which starts Thursday in Reno.